Windows and natural light can be the defining elements in any bathroom as long as they have the right balance of size and placement where privacy may be a concern. 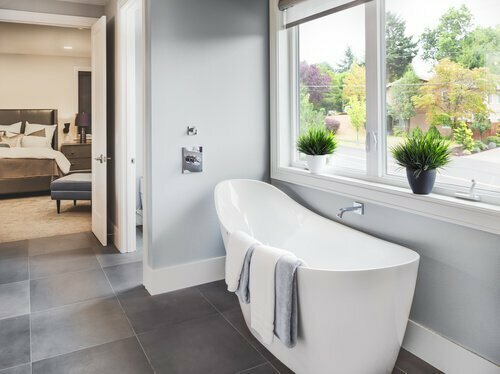 When it comes to bathroom remodeling, Scottsdale homeowners can make windows a focal point, the source of natural light, or both depending on their design and their preference. If you’re remodeling a smaller bathroom or guest bath, you can achieve excellent results by including an accent window in an angular shape such as an oval or octagon or perhaps an arch over a double-hung window. Garden windows help add more dimension to a smaller bathroom while giving your indoor plants a place to thrive. Focal-Point bathroom windows can bathe the area in natural light with a large bathroom window that is tall, wide, and slightly arched. This can offer a stunning focal point and bold decoration. Floor-to-ceiling windows offer dramatic views of the surrounding landscape, where privacy is not a concern. Of course, bathroom is a very personal space, so it’s important that you preserve your privacy. Whether you have large picture windows or a small window situated high on the wall, you should consider installing retractable screens. A circular window placed high on the wall above the bathtub, narrow clerestory windows or an operable skylight can all be solutions to natural light while affording privacy. There are endless options for bringing natural light to bathroom remodeling in Scottsdale. It all starts with having the right bathroom remodeling partner like Republic West Remodeling to help you refine your ideas and realize them in the bathroom of your dreams.